The other day while sitting in the Aquarium, someone walked in looking for a friend. He worked on rigging the solar stage at the Gathering of the Vibes. He had a strange story to tell. 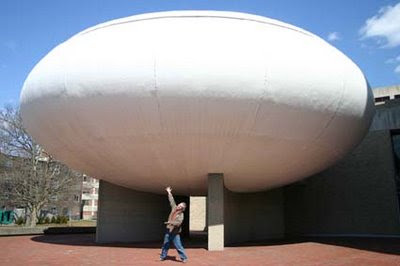 It seems one year he had been invited to a mysterious sonic and robotic event inside a UFO-shaped building not far from Seaside Park, where the Vibes are held. I know the University of Bridgeport campus well, having been there many times, to the WPKN radio station or the library. I remembered seeing an odd shaped building, always wondered what it was, never paid much attention, so this got me curious. I asked Jon Nowinski of SRGA to join me on a field trip to investigate. This UFO-shaped protusion is annex to the Arnold Bernhard Center at 84 Iranistan Avenue, over looking Long Island Sound. It's part of the UB School of Arts and Sciences building. The art gallery inside is currently featuring a very interesting avant-garde international graphic design exhibition. I inquired and discovered the Austin W. Mather theatre was built back in 1980... but "beleive it or not!" closed shortly after in 1981 when the City of Bridgeport passed an ordinance mandating all public buildings required two fire emergency exits. Yes, my friends... this amazing looking tourist roadside attraction, has been boarded up for 28 years!!! Isn't that nuts? They never built a second exit, they just left it the way it was, locked the doors and threw away the key. Would seem to be a no brainer. Anyone who has ever seen a plane release its passengers from the rear, or your average b-sci-fi UFO flick, knows exactly where the ramp needs to go, right where I'm pointing in the above photo! I started speculating wildly as to what may have caused this to happen. Back in the 70's Bridgeport was a Sikorsky company town! Their engineers would use the Bridgeport Public Library Science & Technology room where hundreds of industry trade journals and thousands of technical books made it one of the best engineering reference library in the North East. The Connecticut Inventors Club met there once a month. I was a member. I attended often. The Science & Technology room was also home of the largest selection of UFO-related titles I'd ever laid my eyes on... rows and rows of UFO books, filled with photographs, much I had never seen before or seen since. It made sense, Sikorsky didn't want to leave any rocks unturned. Old man Sikorsky wanted to build the best possible vertical take-off aircraft possible. So he had his people study everything, no matter how far fetched, for ideas and inspiration, from the flight of insects, to UFO flying pattern reports. Sikorsky had originally been invited to set up shop in Connecticut by Howard Hughes himself, who brought him over from France, and became his first customer. Then the old visionary died, and United Technologies bought Sikorsky. I suppose in their grand wisdom, decided much of the material and topics on display at the "public" library may have been a little too sensitive for national security. So they took all their stuff back, closed down the Science & Technology room, in essence ripping the heart out of the community. I suspect the Austin W. Mather Theatre may have fallen victim to the pull out by Sikorsky from its interaction with the City. 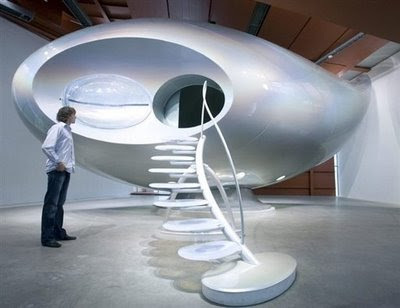 This UFO-shaped building may have been built as a testament to avionics and aeronautics, a piercing arrow into a bold new future of flying ships. So what happened? The Center for Green Building is proud to present our Spring 2009 Speaking of Green Series that will cover the many faces of the evolving environmental movement. Every Thursday evening, from 6pm-8pm, we will be hosting a free workshop, seminar, discussion or movie screening that will be accompanied by an industry professional guest speaker. Carolyn is a Photovoltaic System Designer at Sunlight Solar. She will be speaking about solar possibilities and the new leasing program. Carolyn has been speaking across the state to get the message about solar energy out to consumers as well as educate the general public about this wonderful opportunity for clean and green energy. Wind Power, Public Transportation, Environmental Stewardship, Nutrition and much more. We look forward to seeing you at the Center for Green Building! Please call our showroom or check our events page on our website for updates. Feel free to forward this to your friends.